Hayes’ Jwan Lyles (2) hangs in the air before cashing in on a short jumper during the first half of Tuesday’s OCC showdown against visiting Dublin Jerome. 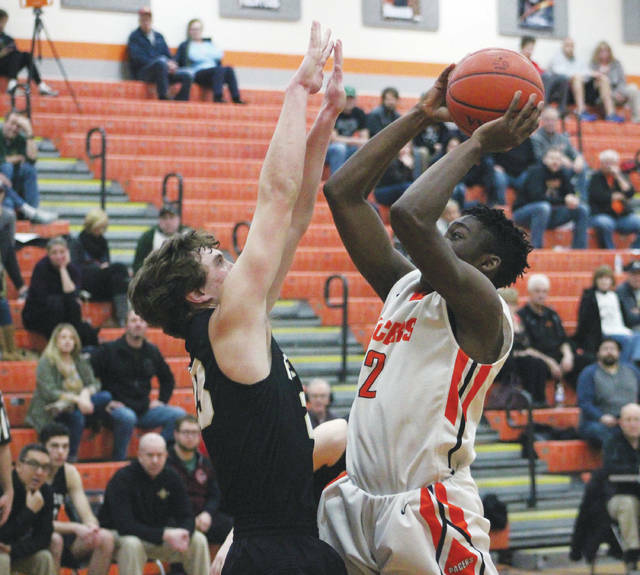 Dublin Jerome’s Andrew Golda scored back-to-back baskets late in the fourth quarter to give the visiting Celtics the lead and the Delaware Hayes boys basketball team never quite recovered en route to a 56-53 loss Tuesday in Delaware. Golda scored all nine of his points in the second half after sitting out the first for the Celtics (5-4, 2-3), who were led by Trey Ballengee’s 14 points. Joseph Gatien had a steal before finding Golda for the go-ahead bucket. Golda scored again on the next possession off a Ballengee assist that came after a Delaware turnover. “Stopping the defensive transition and stopping the offensive rebounding for them were the two keys that we had for them and I didn’t think we did either one of them very well,” Blackburn said. The Pacers rallied from a five-point deficit midway through the fourth. Terin Kinsway’s pass from the low post out to Addison Harvey was deflected into the hands of teammate Paul Burris, who laid it in to cut the deficit to three. After a Jerome turnover, Kinsway drove the lane and kicked out to Burris in the right corner, who buried a three to tie it 46-46 with 3:52 left. Delaware was within range the final couple of minutes, but a Golda block that he finished on the other end pushed the lead to 56-50 with under 10 seconds left to seal it. Nate Griggs buried a three at the buzzer to cap the scoring. Terin Kinsway scored the Pacers’ first 1o points before Dominic Byers came off the bench and hit a three and a two – both off Addison Harvey feeds to give the Pacers a 15-10 edge. Gatien buried a three-pointer to start a 7-0 spurt for the Celtics before Jwan Lyles tied it 17-17 on a basket to end the first. Gatien finished with 10 points for Jerome. Two Griggs free throws gave the Pacers the lead with 6:26 left in the half – a lead they held until the break. Delaware went 11 of 13 at the free throw line in the first half, helping it to a 30-24 lead at the break. Joey Pickering’s three started an 8-2 run for the Celtics to open the third. The teams went back-and-forth throughout the frame before Preston Streator found Nathan Montgomery in the final seconds of the third to give Jerome a 43-41 lead. “They came out and really asserted themselves on the offensive glass,” Blackburn said. “They got some runouts (as well). Kinsway finished with a game-high 21 points and Griggs and Burris each had nine apiece to lead the Pacers (4-8, 3-3), who dropped their fourth straight. Delaware travels to Toledo Scott Monday night in non-league action. Tip is scheduled for 7:30 p.m.